This Mommy Loves crafts, party planning, and coming up with fun activities to do with the kids. I was recently a bridemaid in my dear friend, Kristen's, wedding. Kristen is a real DIY girl and there were so many elements to her wedding that are worth sharing. I will be highlighting a few in the weeks ahead. 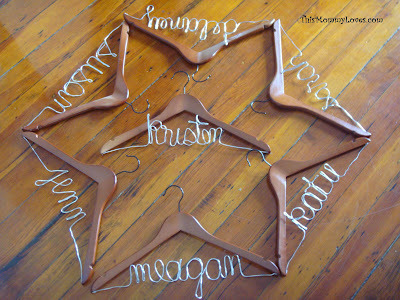 For starters, check out these adorable, bridal party hangers that the bride handmade for each of her attendants. These are so original and creative. I have been a bridesmaid 6 times and I've never seen these before. Don't you just love?!? Bend your craft wire into cursive letters leaving enough room on each end for you to glue onto your wooden hanger. Tip: WorksheetWorks.com has a cool cursive text generator that you can use as a guide for each name. Not only are they a cute gift idea for your bridal party, but they are also functional. No need to worry about dresses that are the same size getting mixed up between girls. It also makes for an adorable photo of all the dresses hanging together. For the not-so-crafty or too-pressed-for-time bride, you can always purchase these hangers from a variety of sellers on Etsy. Aressa is just one example of many that provide these personalized clothes hangers for bridal parties. I've shared this idea at the following Link Parties. Terrific and useful bridesmaid gift! Something for the wedding and after. What a treasure! Great idea, Mrs. Kristin. Those turned out fantastic!! What a great idea! Those are SO cute! Great idea! Wow what a cute idea and great gift! Oh dear!! My cousin just got engaged last night!! I am SO going to make these!! I've been in about a dozen weddings and have never seen this. I love it!! Great idea! Now those are so clever! I will be passing this idea on. I love those! I actually saw something like that in a magazine, but they were SUPEr expensive! 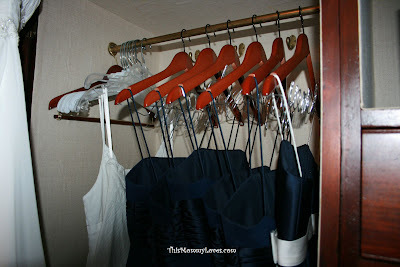 And how clever to use them for bridesmaid dresses to help keep them separate! So cool for personalized bridesmaid gifts ideas! This Mommy Loves by Jenn Bloom Epstein. Powered by Blogger.